Abe R. Druss, retired military officer, builder, Roslyn Heights, N.Y., on June 18, 2010. Born in Brooklyn, N.Y., on August 14, 1906, Druss graduated from Erasmus Hall H.S. when he was 15. At Columbia, he made the Dean’s List, was on the wrestling team and competed in the cane-spree. He was one of the first residents of John Jay Hall, moving into his 13th floor room prior to elevator service. Druss was a member of Sigma Alpha Mu fraternity. He worked on Wall Street and was on the floor when the market crashed in 1929. In 1933, he took a solo trip around the world, including climbing Half Dome in Yosemite. Druss was a combat intelligence officer in Europe during WWII. He invented an analytical tool for compiling data from multiple sources, dubbed the “Druss Matrix” by his colleagues. Druss continued his Intelligence Corps career after the war and was a retired lieutenant colonel in the Army Reserves. He built residential developments in Bethlehem, Pa., and on Long Island, N.Y., in Smithtown, Hauppauge and Riverhead. Druss is survived by his wife of 60 years, Mildred; children, Mark ’66, ’78 GSAS, Sarah and David; and many grandchildren. Chester A. Cole Jr., retired shipping executive, Dayville, Conn., on June 4, 2010. Cole was born on Staten Island, N.Y., on July 11, 1911, and served in the Navy during WWII. He had a varied career as an executive in several international shipping businesses in New York City, Tokyo and Seattle. He and his wife, the former Ruth Joline, retired to Francestown, N.H., and later lived in Woodstock, Conn., and Brooklyn, Conn. As a young man, Cole was an avid and accomplished sailor in the waters around New York City. In retirement, he studied watercolor painting, and his work was shown in several galleries. Cole was predeceased by his wife and by his son, Christopher. He is survived by a granddaughter and a daughter-in-law. William C. Oberkirk, retired engineer, Old Lyme, Conn., on June 6, 2010. Oberkirk was born on November 8, 1913, and raised in the Bronx. He graduated from Brooklyn Technical H.S., then earned a B.A. from the College followed by a B.S. in 1936 from the Engineering School. As chief engineer, he managed the electrical power distribution systems in multiple manufacturing facilities of United Merchants. He was a senior lifetime member of the Institute of Electrical and Electronics Engineers. Oberkirk was predeceased by his wife, the former Olga Remien, in 2005, and is survived by her brother, Arthur Remien, and cousins, Joyce Manke, Irma Naumann, David Remien, Janet Remien and Otti Messner. Irving N. Wolfson, physician, Worcester, Mass., on July 8, 2010. Born on July 20, 1919, in New York City, Wolfson earned his M.D. from Yale in 1943 and was an Army medical officer in India and China during WWII. Following an internship at Mt. Sinai Hospital and several residencies, he relocated to Worcester, where he practiced internal medicine and later cardiology. Wolfson held many leadership positions in the Worcester medical community and was a member of multiple medical associations. Throughout his life, Wolfson was a champion of progressive political causes and was a longtime supporter of Amnesty International, UNICEF and the ACLU. He was active in the Unitarian Universalist Church of Worcester and had served as a member of its board. In his later years, Wolfson became an amateur musician and accomplished painter. He was preceded in death in 1983 by his wife of 37 years, Annabel Kreider Wolfson. He is survived by his sister, Florence Howitt; children, Richard and his wife, Artley, Helen and her husband, Eric Thomas, and Charles; six grandchildren; and one great-grandchild. Memorial contributions may be made to Amnesty International USA, 5 Penn Plaza, New York, NY 10001 or to the Unitarian Church of Worcester, 90 Holden St., Worcester, MA 01606-3411. Robert J. Alexander, professor emeritus of economics and political science, Piscataway, N.J., on April 27, 2010. Born in Canton, Ohio, and raised in Leonia, N.J., Alexander was an Army Air Force veteran, serving in WWII. He joined the Rutgers economics department in 1947 and retired in 1989. Alexander earned a Ph.D. in economics in 1950 from GSAS. Although a member of the economics faculty at Rutgers, he also taught history, political science and labor studies. Following his retirement, Alexander continued his research and writing and taught two courses in the history department each year until 2002. He received the 1984 Outstanding Teacher Award from the Parents Association of Rutgers College. A renowned and prolific scholar, Alexander was the author or editor of 49 books. In 1961, he was named by President-elect Kennedy to the Task Force on Latin America, which recommended the establishment of the Alliance for Progress. Alexander was predeceased by his wife of 54 years, the former Joan O. Powell, and a sister, Margaret LeSourd. Surviving are a son, Anthony R.; a daughter, Margaret (Meg) Bradley; three grandchildren; and a niece. Memorial contributions may be made to the Special Collections and University Archives, Rutgers University Libraries. Hector G. Dowd ’40 pitched for Columbia against Princeton at Baker Field on May 17, 1939, in the first televised sports event. 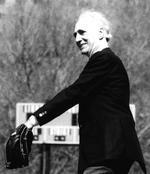 Here, in 1989, he threw out a ceremonial first pitch to mark the 50th anniversary of that landmark game. PHOTO: PAUL HUEGEL, PRINCETON UNIVERSITYHector G. Dowd, attorney, Scarsdale, N.Y., on June 23, 2010. Dowd was born on July 19, 1919, and attended St. Augustine in the Bronx and Fordham Prep, where he pitched for the team that won the city baseball title in 1936. At Columbia, Dowd was a star pitcher during the 1938, 1939 and 1940 seasons; he was the Lions’ pitcher on May 17, 1939, when the Princeton-Columbia game at Baker Field became the first televised sporting event. Dowd’s studies at Harvard Law were interrupted by WWII, in which he served as an Army lieutenant in the Pacific. 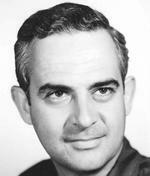 After completing law school in 1946, he and Richard Netter became lifetime law partners, ultimately at Singer Netter Dowd & Berman in White Plains, N.Y. Dowd served on the boards of foundations that contributed hundreds of thousands of dollars to Columbia, including the Louis Armstrong Educational Foundation and the Arnold D. Frese Foundation. He was an active alumnus and supporter of Columbia and its sports teams, serving in the Varsity ‘C’ Club, including as president from 1960–63. In 1963, he was awarded the Alumni Athletic Award. Dowd is survived by his wife of 61 years, Isabel (“Chabela”); daughter and son-in-law, Isabel and Neil Christie; son, Hector; and five grandchildren. Julius J. Fillips, retired school head of guidance and counseling, Whitesboro, N.Y., on June 20, 2010. Fillips was born on November 9, 1916, in Highland, N.Y., and became the first in his family to complete high school. After completing his undergraduate degree, he continued his studies at Teachers College. He began his long career in education in 1941 at Whitesboro H.S. and in 1943 married fellow teacher Ruth Goldsmith. As the head of guidance and counseling, Fillips helped individual students and also refined policies throughout the district. Upon retirement in 1977, he and his wife traveled, visiting their children overseas and participating in Elder Hostel programs. Fillips also enjoyed tending to his garden and yard and was a Master Gardener. He was predeceased by his wife and is survived by his daughters, Barbara Goldsmith Fillips and Carol Fillips McCreary; two granddaughters; three nieces; a nephew; and several great-nieces and great-nephews. John M. “Jack” McDonald, retired attorney, Allentown, Pa., on June 27, 2010. McDonald was born on June 23, 1919, in New York City. He graduated from Fordham Law in 1944 and was employed by Associated Industries of New York State as legislative counsel prior to joining Bethlehem Steel in 1958. He retired from Bethlehem Steel in 1982 as the manager of the State Government Affairs Division in the Public Affairs Department. McDonald was later employed as an attorney at Killian & Gephardt Law Firm in Harrisburg, Pa. He was predeceased by his wife, Lois, in 2004, and is survived by his sister, Muriel Cook; sisters-in-law, Hilda McDonald and Barbara Miller; and many nieces, nephews, great-nieces, great-nephews and cousins. Memorial contributions may be made to Franciscan Oaks Benevolence Fund, 19 Pocono Rd., Denville, NJ 07834. Frank P. Gherardi, accountant, Wethersfield, Conn., on June 28, 2010. Born in 1920 in Mount Vernon, N.Y., Gherardi was the first in his family to attend college. He enrolled in the Class of 1942 as a French major. WWII intervened and he was drafted into the Army, where he served as an interpreter in an Intelligence Unit in France. Post-war, Gherardi returned to Columbia and graduated in 1947 from the Business School with a B.S. in accounting. He was an auditor for Arthur Young & Co and moved to Hartford in 1955. He also was an accountant for Catawba Corp. and a partner in the accounting firm Gherardi & O’Donnell. In 1956, Gherardi married Mary (“Bella”) Markstein, who survives him, as do his sister, Tina; brother, Jack; daughter, Mary Elizabeth and her husband, Tom Wood; a granddaughter; and many nieces and nephews. Memorial contributions may be made to F.N. Good News Fund, 48 Cottage St., East Berlin, CT 06023. Justin B. “Jud” Thompson, retired business executive, Houston, on May 30, 2010. Thompson was born in East Hampton, N.Y., in 1920 and served as a lieutenant in the Navy, attending officer’s training at Notre Dame and serving in the Pacific Theater in WWII. He had a 36-year career with Exxon Oil Co. and moved to Houston with his family in 1961. Thompson is survived by his wife of 67 years, Doris; daughter Claire; sons, Justin Jr. and his wife, Sue, and John and his wife, Christina; brother, Andrew; six grandchildren; and two great-grandchildren. Charles C. Cole Jr., retired professor and college president, Columbus, Ohio, on June 18, 2010. Cole was born on September 12, 1922, in Altoona, Pa., and grew up in Gettysburg, New York City and Yonkers. He served in the Army Air Corps as a 1st Lieutenant and fighter pilot in the 8th Air Force from 1943–45. He married Mary E. Ewald in 1944. Cole dedicated his career to advancing higher education and promoting the humanities. He earned a Ph.D. in history in 1951 from GSAS and from 1946–58 was Columbia’s associate dean of students and taught American history. Cole was then professor of history, dean and provost at Lafayette College from 1958–70 and president of Wilson College from 1970–75. He was executive director of the Ohio Humanities Council from 1976–90. Upon retiring, Cole focused his research and writing on Ohio history. He received many awards for his work and research and was an active volunteer. Cole is survived by his sister, Patricia Ewald; brother, Dan; daughters, Phyllis Stanley, Dot Briscoe, Barb Sweigard and Beth; eight grandchildren; and three great-grandsons. Memorial contributions may be made to the Ohioana Library Association, 274 E. 1st Ave., Columbus, OH 43201-3692 or to the Sierra Club, 85 Second St., 2nd Fl., San Francisco, CA 94105. Ira W. Gabrielson, retired physician and professor, Williamsburg, Mass., on January 18, 2010. Gabrielson was born in the Bronx and was a graduate of the Horace Mann School. He met his wife, Mary Oliver ’50 P&S, when they were both medical students at Columbia; Gabrielson earned a degree in 1949 from P&S. After completing his residency in pediatrics at Yale, Gabrielson earned a master’s in public health at Johns Hopkins and spent the better part of his career teaching at Yale, UC Berkeley and the Medical College of Pennsylvania in Philadelphia. Gabrielson retired in 1989 as chairman of the Department of Preventive Medicine at MCP. He was a Renaissance man, accomplished in the arts and sciences, drawing, woodworking, gardening and rowing. Gabrielson was an elected member of the Williamsburg Board of Health and volunteered with many community organizations. He is survived by his wife of 61 years; children, Debby, David, Hugh and Carl; sister, Carol Fine; six grandchildren; and two nieces. Memorial contributions may be made to Doctors Without Borders. John T. Lorick Jr. ’44John T. Lorick Jr., marketing and advertising executive, Los Angeles, on June 19, 2010. Lorick was born on March 4, 1923, in Astoria, N.Y. He received a Pulitzer scholarship, which provided for his education at Columbia, where in addition to excelling academically he played both varsity basketball and baseball. As an undergraduate, Lorick enlisted in the Marine Corps. He completed his undergraduate work in 1944 at Yale, where he attended Officers Training School. He served in the 1945 invasion and occupation of Japan, returning home in 1946 to attend Harvard Business School. Lorick married Genevieve Grill in 1950; she predeceased him in 2006. He is survived by seven children, eight grandchildren and two great-grandchildren. Memorial contributions may be made to the John Douglas French Alzheimer’s Association, The American Heart Association or Our Lady of Malibu Catholic Church. Justin C. Walker, retired physician, Yonkers, N.Y., on May 31, 2010. Born and raised in the Bronx, Walker attended Regis H.S. and served in the Infantry during WWII, active in campaigns with the 42nd Rainbow Division in both France and Germany. He participated in the liberation of the concentration camp at Dachau on April 29, 1945. Walker was awarded the Bronze Star Medal for Heroism, the Bronze Star Medal with Oak Leaf Cluster and the New York Conspicuous Service Medal. Following military service, he graduated from SUNY Downstate Medical Center, College of Medicine, and received his training in general surgery at St. Vincent’s Hospital in New York City, where he met the nurse who would become his wife, Gloria Locker. Walker joined the staff at St. John’s Riverside Hospital in 1956 and during his 42-year career held a number of executive positions in the hospital arena as well as in professional associations. Walker is survived by his wife of 56 years; daughters, Susan and her husband, Michael Shepherd, and Patricia; sons, William and John; daughter-in-law, Ellen; and three grandchildren. Memorial contributions may be made to Pathfinder Village, 3 Chenango Rd., Edmeston, NY 13335-2314. Nolan D. Lewis, retired airline employee, banker, South Salem, N.Y., on June 20, 2010. Born on June 11, 1923, in Washington, D.C., Lewis was a graduate of New Rochelle H.S. He spent most of his career in airline transportation. He was a ticket office manager for Colonial Airlines and also a terminal manager for Eastern Airlines. Lewis worked in Eastern’s home office as a customer service representative and then worked for a number of years for the Eastern’s terminal corporation as one of its managers. When the New York terminals closed, he began a second career in banking with The Bank of New York. Lewis is survived by his sister, Mary Ann, and a large extended family. Robert H. Young ’47Robert H. Young, retired television broadcaster, Ridgewood, N.J., on January 19, 2011. Born on November 7, 1923, in Covington, Ky., Young served in the Armed Air Forces in WWII as a co-pilot; he survived being shot down and captured in the European theatre. Young’s career in television broadcasting began in 1960, when he took his initial job as news director for NBC affiliate WNDU-TV in South Bend, Ind. Returning to New York, he reported for and anchored the WCBS nightly news broadcast, including coverage of the assassination of President Kennedy. At ABC News, he was one of the first correspondents dispatched to cover the Vietnam War, in 1965. Young became the network’s chief European news correspondent; based in London, he traveled the continent reporting on the major stories for two years. Back in the States, he filled the anchor seat for the ABC World News Broadcast, completing his news career in 1975. Young is survived by his children, Robert, Michael, and Amy Brown; and six grandchildren. He was predeceased by his second wife, Shelly, in 2006, and his first wife and the mother of his children, Shirley “Penny” Young, in 2009. Albert F. Serocke, retired salesman, Kennett Square, Pa., on June 26, 2010. Born in Chicago, Serocke was a salesman for Fieldcrest Mills in New York City for 25 years, retiring in 1981. He was a graduate of Poly Prep High in Brooklyn, N.Y., and served in the Army during WWII. Serocke enjoyed collecting coins and stamps and was an avid reader. He is survived by his sons, Christopher and his wife, Joyce, and Jeffrey and his wife, Adele; daughters, Kathleen Lisi and her husband, Stephen, and Patricia Cabuling and her husband, Manny; and 10 grandchildren. Memorial contributions may be made to Ware Presbyterian Village, Employee Fund, 7 E. Locust St., Oxford, PA 19363. Mortimer J. Shaff, retired publishing executive, New York City, on May 18, 2010. Shaff was valedictorian of the Class in 1948 and was Phi Beta Kappa. He studied foreign languages at Cornell by direction of the Army. Shaff served five years in the Army as a captain in the Intelligence Corps in Korea (1949–53) and then worked for Random House Publishing until his retirement. He is survived by a nephew and two great-nephews. David N. Ilchert, retired INS executive, Novato, Calif., on August 9, 2010. A native of Astoria, N.Y., Ilchert was a resident of Novato since 1963. A veteran of WWII, having served in the Navy, he earned a law degree from NYU and had a successful career in the INS, rising to San Francisco District Director. He held that position until he retired in 1994. Ilchert was a member of such organizations as the Lions Club and the Knights of Columbus. He was president of the Novato Lions Club numerous times. Ilchert is survived by his wife of 58 years, Wanda; sister, Dorothea; daughter, Joan Christensen and her husband, Tim; son, David and his wife, Juli; four grandchildren; and one great-grandchild. William J. Hill, quality control expert, Weston, Conn., on September 20, 2010. Born in Manhattan on October 16, 1928, Hill, and his family, moved to Rockville Centre, N.Y., where he attended Southside H.S. He earned a degree in 1951 from GSAS. After graduating with distinction, Hill held positions of increasing responsibility and gained expertise in quality control. Before forming his own consulting firm, Hill was a consultant for Con Ed, where he developed and implemented the Indian Point nuclear audit program. In recognition of his work in quality control, he was named a fellow of the American Society of Quality Control, the highest honor that can be bestowed on a member. Aside from serving on the ASQC for 15 years, Hill was a senior member of the Institute of Electrical and Electronics Engineers. He was a crossword puzzle enthusiast and lifelong dog lover. Hill is survived by his wife of 56 years, Frances; sons, Denis, Paul and Ronald; daughter, Andrea; and six grandchildren. Memorial contributions may be made to Vitas Hospice Services (vitas.com). Ronald H. Boorse, retired business owner, Houston, on July 6, 2010. Boorse was born on May 17, 1935, in New York City. In 1960 he started a career in the business forms industry, working for Standard Register in New York. Eventually he moved to Houston, where he started his own business, United Business Forms, in 1979; he continued it until his 2005 retirement. Boorse was active in industry associations as well as the South End Optimist Club. He was predeceased by his son, John, and is survived by his daughter and son-in-law, Linda and Mark Powers; son, Henry II; daughter, Alexis R. Marly; four grandchildren; sister and brother-in-law, Suzanne and Claude Remond; and ex-wife, Peggy J. Boorse. Memorial contributions may be made to Houston Hospice, 1905 Holcombe, Houston, TX 77030. George Dickstein, teacher, Riverdale, N.Y., on February 3, 2010. While he spent most of his career in public relations and advertising, Dickstein found his true passion at 69 when he began teaching at Westchester Community College. He worked at the college for about four years, first as a tutor in the Academic Support Center and in the Writing Tutorial, and later as a teacher of basic writing and composition, and literature. 1932 Alexander J. Harsanyi, retired writer, editor and translator, Wallingford, Conn., on May 27, 2011. Julius Wolfram, physician, Dallas, on March 16, 2011. 1933 Leo Rangell, psychoanalyst and emeritus professor, Los Angeles, on May 28, 2011. 1935 Edwin K. Large Jr., retired attorney, Evans, Ga., on April 3, 2011. 1938 Paul F. Angiolillo, retired professor, Weston, Mass., on June 5, 2011. 1939 Richard C. Fremon, retired, Hackettstown, N.J., on April 25, 2011. David B. Hertz, professor emeritus, Miami, on June 13, 2011. John H. Woodruff, retired radiologist, medical consultant, Bloomfield, Conn., on June 12, 2011. 1940 Hermon W. “Hy” Farwell Jr., retired speech professor, Pueblo, Colo., on April 6, 2011. Philip M. Greenberg, retired psychiatrist, Jupiter, Fla., on June 16, 2011. Alfred P. Minervini, retired construction industry executive, Scarsdale, N.Y., on March 24, 2011. 1943 Alvin Lukashok, New York City, on June 20, 2011. Theodore E. Plucinski, physician, Brooklyn, N.Y., on April 1, 2011. Sidney Warschausky, teacher, Ann Arbor, Mich., on April 9, 2011. 1944 William W. Baines Jr., retired sales representative, Owings Mills, Md., on May 26, 2011. Richard D. Hunter, retired minister, Arlington, Mass., on February 25, 2011. 1946 Charles H. Arnoldi Jr., retired surgeon, University Park, Fla., on April 26, 2011. Atherton “Toni” Bristol, retired coach, Lakeville, Minn., on May 21, 2011. R. Glen Keyes, small-business owner, Asheboro, N.C., on June 26, 2011. 1948 Richard van Frank, retired editor, Montclair, N.J., on July 4, 2011. 1949 Thomas A. Kimmons, Rockville Centre, N.Y., on February 16, 2011. Jesse S. Siegel, Fort Lauderdale, Fla., on May 10, 2011. 1950 Edwin H. Arnaudin Jr., Richmond, Va., on April 3, 2011. Everett L. Dodrill Jr., Cleveland Heights, Ohio, on March 1, 2011. Walter P. Luikart, physician, Thetford, Vt., on January 28, 2011. John D. Suomi, retired dentist, New Wilmington, Pa., on May 8, 2011. William Thordarson, Mount Pleasant, S.C., on December 8, 2010. 1952 Nicholas Csonka Jr., retired anesthesiologist, Essexville, Mich., on May 27, 2011. 1954 John L. Garrison, retired Air Force officer, Longwood, Fla., on March 26, 2011. Ellsworth M. Shafto III, Wall Street trader, Basking Ridge, N.J., on May 24, 2011. 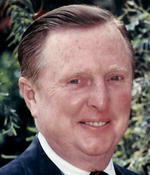 1956 James S. Williams, retired executive, Fallbrook, Calif., on May 22, 2011. 1957 Robert I. Brockman, architect, Haverford, Pa., on June 12, 2011. Frederick W. Korz, retired educator, horologist, Middletown, Conn., on April 4, 2011. Anthony T. Layng, emeritus professor of anthropology, Winston-Salem, N.C., on June 12, 2011. Joachim Neugroschel, literary translator, Brooklyn, N.Y., on May 23, 2011. George A. Omura, professor emeritus of gynecologic oncology, Mountain Brook, Ala., on April 4, 2011. Albert Z. Soletsky, retired associate professor of languages, Hackensack, N.J. on April 24, 2011. Richard A. Donelli, dentist, Pound Ridge, N.Y., on July 24, 2011. Robert J. Capone, retired cardiologist and professor, Clifton Park, N.Y. on June 29, 2011. Ronald S. Kane, appraiser, New York City, on May 30, 2011. Robert W. Maddox, retired Marine Corps officer, Princess Anne, Md., on April 2, 2011. C. Brian O’Gorman, retired attorney, San Diego, on May 24, 2011. Richard W. Thompson, retired psychoanalyst and program manager, New York City, on April 19, 2011. Donald B. Krim, film distributor, New York City, on May 20, 2011. Joseph J. Okon, physician and medical educator, Norwalk, Conn., on May 6, 2011. Joel J. Ouellet, retired Wall Street and real estate executive, San Diego, on February 22, 2011. Joseph Grisanzio, physician, Lakeville, Mass., on May 25, 2011. Brian C. Hesse, anthropological archaeologist, State College, Pa., on April 2, 2011. Josiah T. Greenberg, attorney, Montclair, N.J., on January 5, 2011. Edward A. “Bud” Spraker, retired athletics director and physical education teacher, Teaneck, N.J., on July 3, 2010. Spraker graduated from Farragut H.S., where he lettered in football, basketball and baseball all four years. Before retiring in 1995 after a 32-year career, he was an athletics director and physical education teacher for 26 years at Benjamin Franklin Jr. H.S. in Teaneck, where he founded the Leaders Club. He also had taught at Thomas Jefferson Jr. H.S. in Teaneck for six years. Spraker played football in the Navy and was a Korean War veteran. After the Navy, he continued playing football, for Columbia. Spraker was a longtime member of Christ Episcopal Church in Teaneck, sang in the choir and was Sunday School superintendent for many years. He is survived by his sons, John and Gary; sisters, Edna Shewbrooks, Shirley Moehring and Bobbie; brother, The Rev. James; and one granddaughter. He was predeceased by his wife, Nancy. Memorial contributions may be made to the Alzheimer’s Association. Asher Rubin, retired deputy attorney general, San Francisco, on September 29, 2010. Rubin was born in Atlantic City, N.J., on November 9, 1936. When he was 11, the family moved to Liberty, N.Y. Rubin graduated from Harvard Law in 1961 and moved to California to clerk for Justice Thomas P. White of the California Supreme Court. He joined the office of Attorney General Stanley Mosk in 1963, where he remained until his retirement in 2001, except for a brief interlude in the Office of the General Counsel of the Peace Corps and on the public relations staff of The Weizmann Institute in Israel. As a deputy attorney general, Rubin represented various officials and agencies in appellate and trial litigation involving important political and social issues. He appeared before the United States Supreme Court in two cases, Honig v. Doe and California Human Resources Dept. v. Java, and represented President S.I. Hayakawa during the 1968–69 student strike at San Francisco State University. Rubin also was involved in a number of community groups. He is survived by his wife, Diane; children, Jacob ’06 and Shaina ’09; and brothers, Emanuel, Mordecai, Joseph ’60 and Abba ’63. Dana A. Brand, Mets blogger and English department chair, Sandy Hook, Conn., on May 25, 2011. Brand was born in New York City on September 23, 1954, to Brooklyn Dodgers fans. He grew up in Englewood Cliffs, N.J., and earned two master’s degrees and a doctorate from Yale, specializing in American literature from the Civil War to the mid-20th century. He had been on the Hofstra faculty since 1989. Brand was a former chair of the English Department and taught all genres and periods of American literature, with a main focus on fiction written between 1850–1950. When Brand was a child, his parents dissuaded him from rooting for the hated Yankees. “I’ve been full of simple hope on the first day of every baseball season I can remember,” he wrote on his popular, almost-daily blog (danabrand.com/blog) on April 1. He also wrote two books on being a Mets fan, Mets Fan and The Last Days of Shea: Delight and Despair in the Life of a Mets Fan. Brand is survived by his wife, Sheila Fisher; daughter, Sonia Brand-Fisher; and sisters, Jennifer and Stefanie. Michael W. Stevenson, commercial banking v.p., New York City, on July 19, 2010. Stevenson worked at J.P. Morgan Chase in New York. Survivors include his partner, Richard Berhalter; mother, Lois; sister, Leigh Stevenson Cobb; and nieces and nephews. Memorial contributions may be made to The Town of Chester Public Library, PO Box 451, Chestertown, NY 12817 or Room to Read, 111 Sutter St., 16th Fl., San Francisco, CA 94104. Joshua A. Moreinis, senior planner and landscape painter, Croton-on-Hudson, N.Y., on July 16, 2010. Moreinis earned an M.S. in urban planning in 1988 from the Architecture School. He was a Fulbright Scholar in South Korea, a senior planner at STV and a landscape painter. Moreinis is survived by his wife, Pamela Ivinski; mother and stepfather, Pat Moreinis Dodge and Peter Dodge; and brother, Bram.